2018 Mexico City Homeless World Cup begins tomorrow! To warm-up and build bridges for players at the Homeless World Cup, taking place Nov 13-18th in Mexico City, we did what PS2G does best. We hosted a friendly pick-up game at the scenic Silver Soccer rooftop pitch today. Watch the video recap on Facebook here. 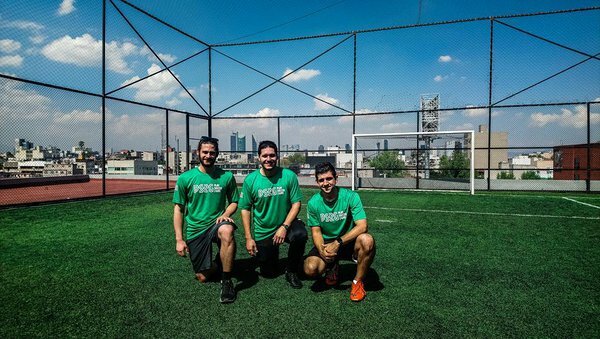 Under cloudless blue skies, with a backdrop of Mexico City’s skyline and surrounding hills we gathered nine-teams from seven countries across two hour-long pick-up sessions. In classic PS2G fashion Caleb Olson set the stage for the friendly atmosphere with a pre-game speech. 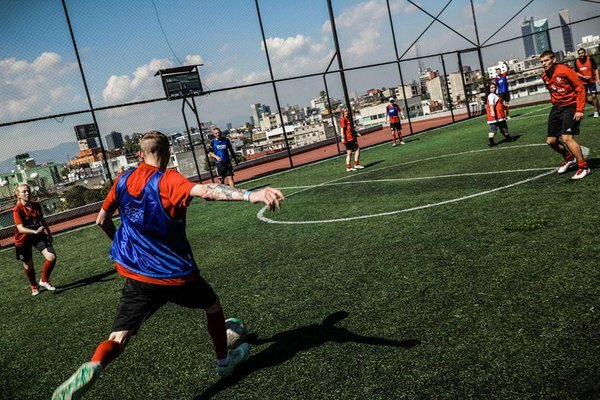 The players, who will be competing against each other for the next week in the Homeless World Cup, got to play with individuals from different countries and make new friends. “They are welcoming, and everybody talks to each other, so it’s pretty cool” said team USA’s Mustafa Mbaye, about playing with players from other nations. Adding that he enjoyed the diversity on the field and the rooftop view. The games showcased some impressive close control and a supportive spirit. Every silky dribble, creative pass, and hustle play solicited cheers and ole’s from the international bench. To honor and encourage fair play PS2G handed out jerseys to individuals who showed outstanding sportsmanship. Our game also helped the players get ready for tomorrow. “Air quality is different, I can tell already,” said Mbaye. At 7382 feet above sea level Mexico City’s altitude is certain to pose a challenge. Aside from making new connections today, the players also got a crucial opportunity to acclimate to the altitude. Today’s plethora of smiles was made possible through you donating to play at our charity pickup games! Find a local game or donate via Givz. Thanks to Jeff Pinilla and Shahar Golan for helping us capture the action!